One of the most anticipated activities at our annual Christmas party is the making of reindeer food. We begin with a large box of oats, though many of the kids do not realize it’s just oats. To this box each group of kids is allowed to add in some holiday magic (glitter). Next someone mixes it all together. 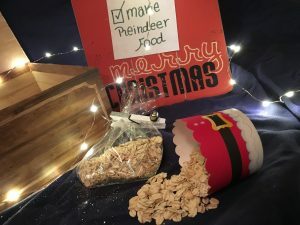 The kids are then given small goodie bags and each child who would like scoops out one scoop of the reindeer food to take home with them and sprinkle in the yard on Christmas eve to give the reindeer a snack while Santa is inside their house. Plan to make more of this that you think you could possibly need, the kids all really get into making this and want to make sure they take home enough!